Not everybody follows the Google+ community “The art of bread”, so I will duplicate my post about a great bread I baked last week. Last year during the christmas holiday, I started my bread baking hobby – basically everything created out of yeasted dough. In the beginning I used the regular “fast-action” yeast – commercial granulated yeast available in small sachets. 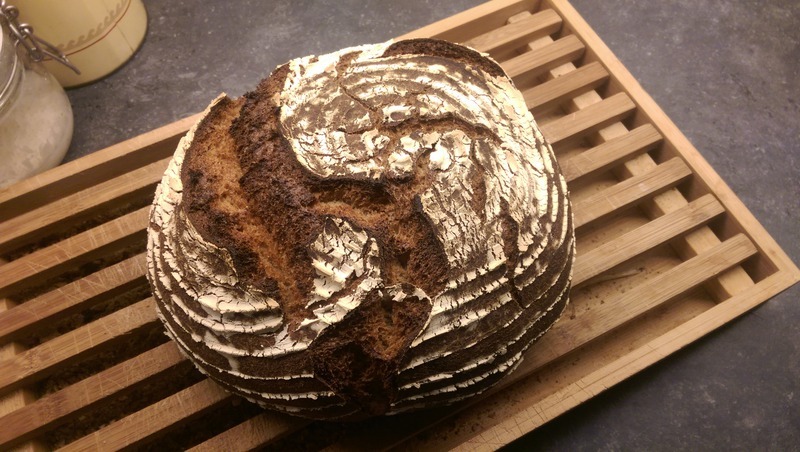 But then I discovered the health benefits of “wild yeasts” and created several “sourdough starters” to experiment with those. It turns out that the breads I bake from my sourdough starters have so much more depth of flavour than the breads I bake with the fast-action commercial yeast… so that’s what we’ve been eating almost exclusively since spring season. I felt it was time to create a rye sourdough starter this year’s christmas holiday period, to see how different the breads would be using this new starter compared to the wheat based starters I have used so far. My wife gave me a book on sourdough by the Swedish baker/writer Martin Johansson. Using his recipe for Rye and Honey sourdough, I ended up with the big loaf in the picture. I never had a sourdough grow so much in volume during its bulk fermentation and proofing stages, it was amazing! This time, the dough kept its strength and structure and gave a perfect result. The added honey creates a beautiful dark and tasty crust, and the crumb is soft, with a delicious blend of the rye and acacia honey. Knead the dough by hand for 10 minutes, then leave it in a covered bowl for its bulk fermentation stage. The recipe estimates this to be 3 to 5 hours, but after 3 hours my dough had expanded to more than double the original volume so at that point I decided to continue with the recipe. Gently press the air out of the dough and fold it into a ball: stretch a bit of the dough to the side and fold it back to the center. Repeat this while rotating the mass of dough. This brings some tension into the skin of the dough ball you are forming. Dust a round proofing basket with flour (or use any kind of bowl lined with a tea towel and sprinkle the towel generously with flour), and place the dough in the basket with the seam down (the seam-side will be facing upward in the oven, thus creating opportunity for the bread to crack open while baking). Cover the basket (or place it inside a big plastic shopping bag) to prevent draught from messing with it and leave it alone in your kitchen for a further 1.5 hours of proofing. When the dough has proofed sufficiently (and roughly doubled in volume again), turn over the basket onto a silicone mat or a sheet of baking parchment, and shove that onto the baking stone in the oven. Pour a cup of cold water into the metal tray on the oven floor – that will produce steam and develop a great crust. Bake for 20 minutes on 240 C with the steam, then lower the temp to 210 C, open the oven door slightly to let the steam escape, close the door again and bake for a further 20 minutes. The smell! The flavor! One of my best. Posted: 26 December, 2014 in Me, Recipes. Looks awesome. I was going to bake this year (cookies, panettone), but just ran out of steam. Still Christmas until Epiphany, as I look at it. Happy holidays! All around the Netherlands you should be able to find flour (wind-)mills where the flour is sold to consumers. Thanks Eric! We’re in the middle of Amsterdam without a car so the broodbakshop looks perfect. Much appreciated. Must get out to a mill at some point though. You absolutely need to include more recipes in your blog here. I love them. I live in the United States in Washington DC and will have to go in search of the flour you use however I look forward to trying this recipes. It looks amazing. Jamie, I bought my whole wheat and rye flour at the nearest (wind-)mill, it’s nothing special except for the fact that it is stone-milled (unlike factory produced flour). Stone milling preserves nutrients and flavors in the grain. Kapusniak made with home made sauerkraut is another easy, tasty dish. bread chopped into cubes adds great flavor to it. 3-4 pans for what the seafood alone costs. Another simple dish with amazing “umami”. Kapusniak looks quite tasteful r_stew, I looked up some recipes out there. Good bread compliments it nicely. You have that part covered, it seems.